« The Redeemer. First Customized Chieftain Dark Horse By Hollister Powersports. Published by Cyril Huze May 14th, 2016	in Editorial and Events. 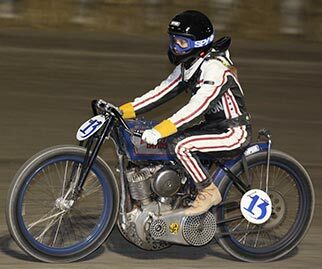 27-year old Brittney Olsen must be the youngest vintage motorcycle racer. After finding out the Sturgis city’s plans to close down the old track for good, Brittney began to think of a way to revive the Sturgis half-mile and its glorious motorcycle racing. 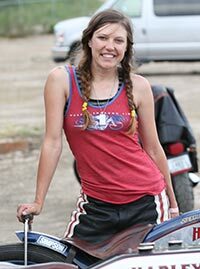 In 2015 she founded 20th Century Racing and claimed two of her victories on the Historical Sturgis Meade County Fairgrounds Half Mile race. Good friend and mentor Bruce Eide approached Brittney after the 75th Sturgis Rally with the idea of hosting a vintage motorcycle festival, thus the concept of The Spirit of Sturgis was conceived. Following months of planning, hard work and gaining the blessing from the city of Sturgis and the Sturgis Chamber of Commerce, Indian Motorcycle Sturgis and Brittney are set to host the first ever Spirit of Sturgis Vintage Motorcycle Festival on Friday, August 26th – Sunday, August 28th of this year. The Spirit of Sturgis Vintage Motorcycle Festival will offer guided Gypsy Tours through the Black Hills and two days of vintage motorcycle races plus a swap meet and antique flea market for vendors, collectors and enthusiasts at the Meade County Fairgrounds located at 1802 Ballpark Road in Sturgis, South Dakota. 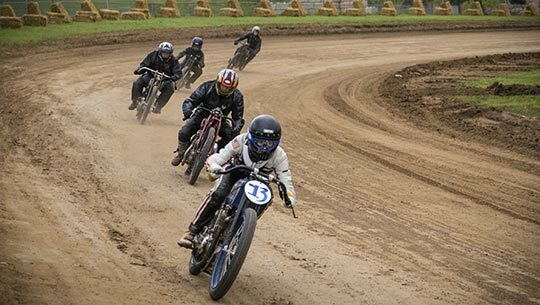 Friday’s main event is the half-mile vintage motorcycle flat track races with classes ranging from the early 1920s through 1980s as well as a benefit party plus vintage bike show following the races Friday night in the infield of the old track. A portion of the proceeds will go to the Sturgis Motorcycle Museum and Hall of Fame. Saturday’s main event features exciting pre-70s “Run What You Brung” dirt drags. “From touring the Black Hills on an old bike, to watching the thrillingly fast vintage racers compete for the Spirit of Sturgis championship title, Sturgis was built upon a multifaceted weekend of motorcycle racing. Now it’s time to bring the grassroots racing back to Sturgis!“ says Britt Olsen. The world renown Oil & Ink Expo will have moto-inspired art by artists from around the globe on display with prints for purchase and free motorcycle films will be playing at dusk at the Harley-Davidson Plaza Rally Point on both Friday and Saturday night. Great, but it’s after the Sturgis Rally! it’s probably passing billy lane off. Roland Sands Indian Sixty Hooligans, Billy Lane Sons Of Speed bpardtrackers, Brittney Olsen Sturgis Vintage Festival. Looks like everybody heading to the track. Congratulations to Brittany and all those working hard to pull this event off. Good to have an option of going to the Sturgis rally or this new venue .Or better yet, going to both! Go Britt! Good luck to you, and all the racers. This will be a wonderful event in the spirit of Sturgis, and vintage racing. A very cool deal no doubt…!!!! Not a problem, they cater to a different crowds……. The PR was quickly followed by Olsen promoting herself as “The Queen of Sturgis.” Might want to dial that back a bit and see if the first year event lives up to the hype. Last time I checked, you had to earn your stripes and pay you dues in this industry beyond just self promotion on social media. Fantastic Family Olsen ! Love ! I would very much like to have information on the schedule of events. We would like to bring a vintage Yamaha 750 to ride the Sturgis half mile. It’s been a dream for years and it is now on my bucket list! Thanks!